From the beginning, the Azoreans hunted whales for oil. 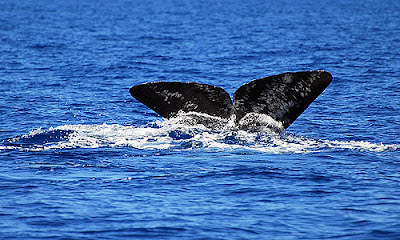 They were so successful that every major Atlantic whaling expedition would stop in the Azores. In 1979, Portugal not only outlawed whaling, but also made the deep waters around the Azores a natural reserve. The economic impact to the whaling industry was replaced by the eco-tourism of whale and marine-life watching that soon took over. Former whalers became guides, spotters, and hosts in museums. Lookout towers (called Vigias) were built in strategic positions high on the mountains and there, experienced searchers watched for the arrival of the sperm whales and sent messages for the whaling boats to be launched. Today the Vigias are used for exactly the same purpose but now the watchers radio to the powerful Rigid Inflatable Boats (RIBs) who can then take their passengers directly to the area in which the whales are swimming. The boats can manouver to within 50 metres of these enormous mammals - the minimum distance suggested by the Whale Watching Code of Ethics. In the case of dolphins, however, the boats can manoeuvre much closer and, given the right conditions, parties of 3 persons (plus a diving instructor), can actually swim with the dolphins. The Azores in general and the narrow gap between Faial and Pico in particular are on the migratory route for various types of Whale and numerous types of Dolphin. Hence the interest of the locals in hunting the whale and the establishment of whaling stations at Lajes do Pico and at Horta on the Island of Faial (the remains of which can be seen today). Whaling in the Azores stopped in 1987 and there is a most interesting museum of the former whaling industry at Lages do Pico, showing the amazingly small boats, the harpoons and all the necessary whaling equipment. It is well worth a visit and illustrates vividly the courage and tenacity of the Whalers (Called locally "Sea Wolves"). It is interesting to note that only sperm whales were hunted by the Azoreans (because it is the only species which floats when dead) and that the total number of whales ever caught by them is exceeded in one year by a single Japanese whale factory ship. Today, whale watching in the Azores often means going out to sea in a small semi-inflatable motor boat in search for the largest mammal on the planet. Launches ferry people to the whales for a close-up encounter. New laws passed by the Regional Government protect the whales and the visitors by limiting the number of boats, and the speed and distance they can use to approach a herd. Experienced guides offer insights into the lives of these creatures and, best of all, seeing a whale is almost guaranteed. This is because on mountainsides throughout the central group of islands, former whalers are posted as spotters, radioing in the position and number of whales to the boats. Local whales include sperm whales, northern bottlenose, pilot, sowerby's beaked whales, and occasionally orcas. Two excellent whaling museums may be found on the island of Pico, detailing the history and culture of the now-banned trade. The species that are commonly sighted on these trips include: Sperm Whales, the largest and most numerous in these waters are individually identified by photographs taken of the undersides of their flukes when diving. The other toothed Whales frequently sighted are Northern Bottlenose Whales, Pilot Whales, Orcas and Sowerby’s Beaked Whales. The Dolphins sighted regularly in these waters are Common, Atlantic Bottlenose, Risso, Atlantic Spotted and Striped Dolphins. The protected waters has not simply been good for the whale watching industry, but has helped numerous whale species to recover and prosper, making whale watching an exciting and unique experience. Azores is located in the Atlantic ocean. This island is a must visit. This place has a subtropical climate. You can find amazing flora and fauna in this island. The main attractions are watching loggerhead turtles and fishes like marlin and swordfish. The other best attraction is the giant whales.